What Could Happen? 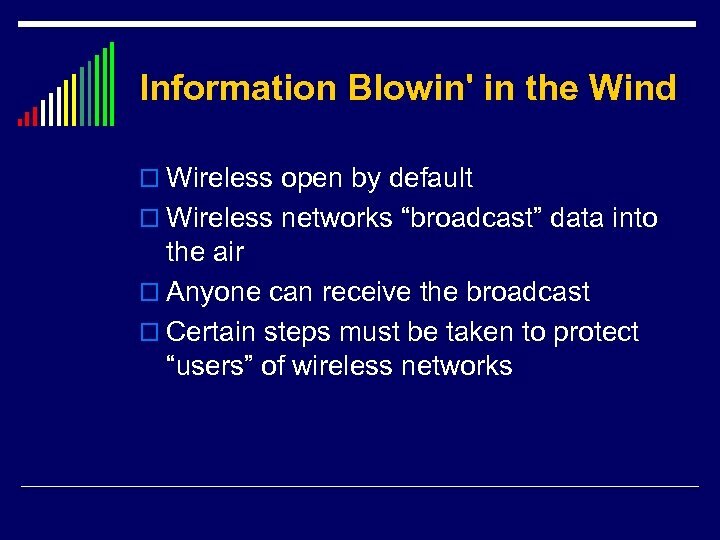 q q Slow down your Internet performance. 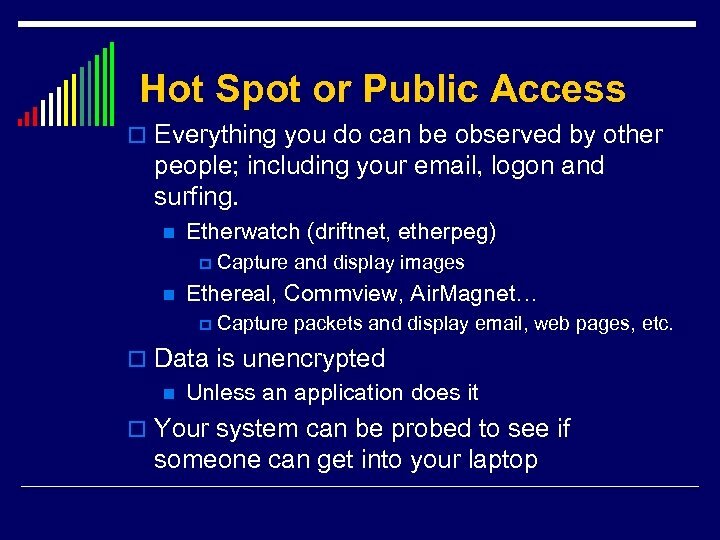 View files on your computers and spread dangerous software. 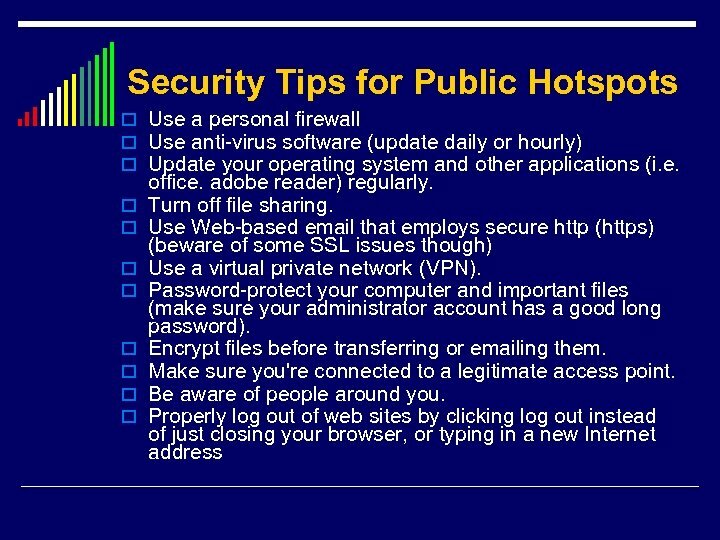 Monitor the Web sites you visit, read your e-mail and instant messages as they travel across the network, and copy your usernames and passwords. 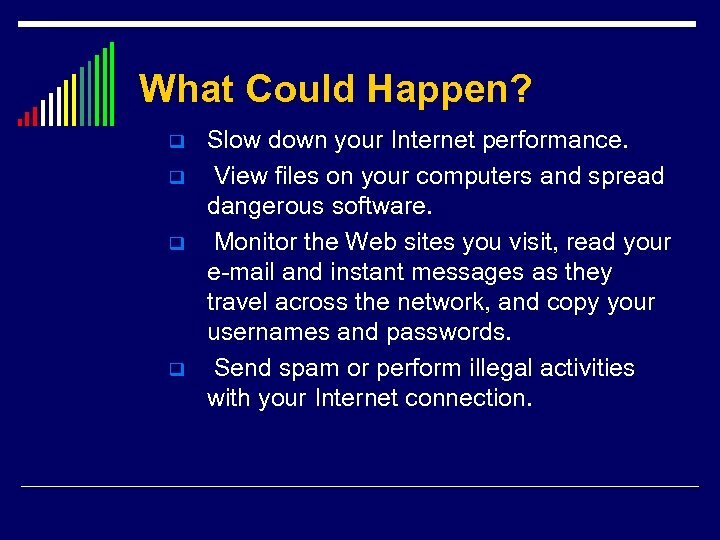 Send spam or perform illegal activities with your Internet connection. 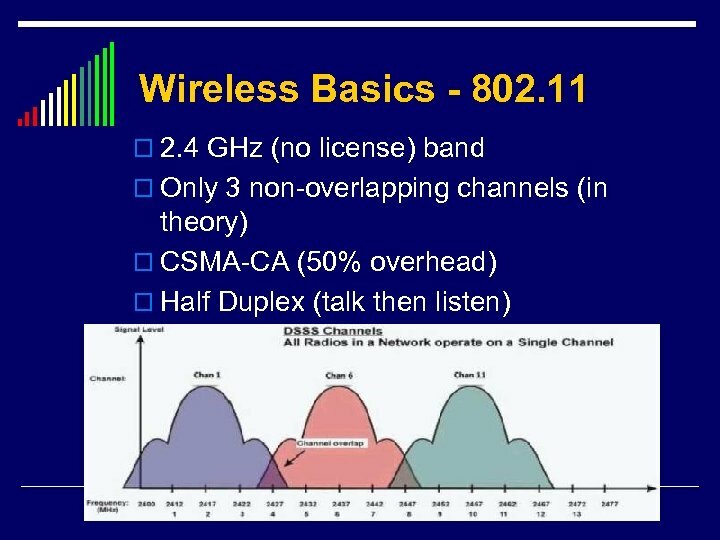 Cell Sizing: o How far is your WIFI signal going? 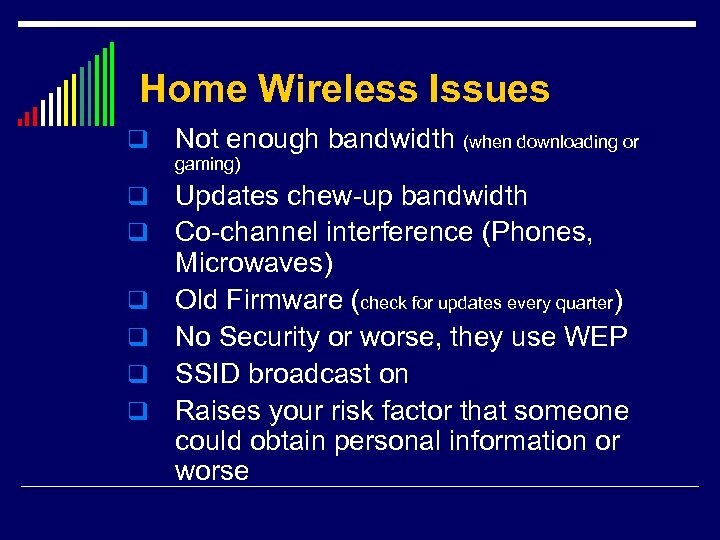 (that is called your cell size) n I can pickup wireless when I go visiting family in ID or CO by just turning on my laptop o Can’t cover whole house? n Repeater n Better antenna n MIMO n 802. 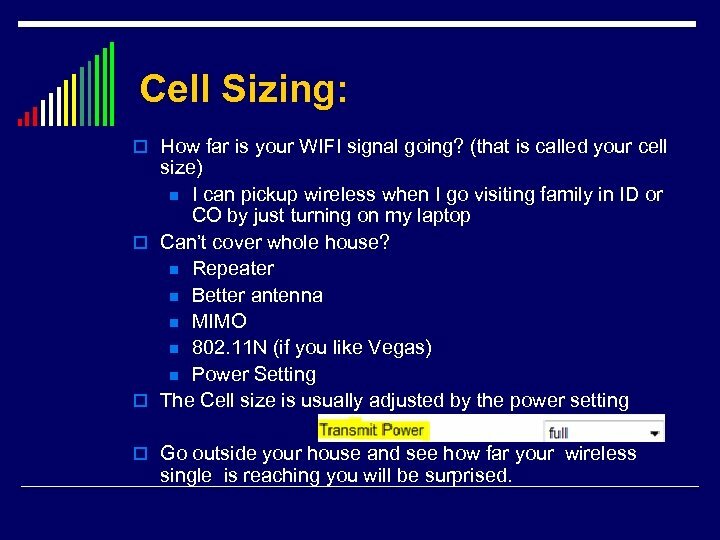 11 N (if you like Vegas) n Power Setting o The Cell size is usually adjusted by the power setting o Go outside your house and see how far your wireless single is reaching you will be surprised. 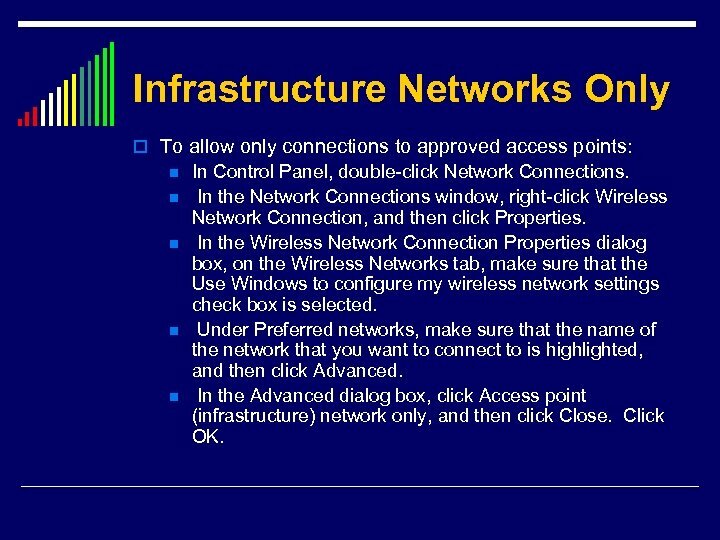 Infrastructure Networks Only o To allow only connections to approved access points: n n n In Control Panel, double-click Network Connections. 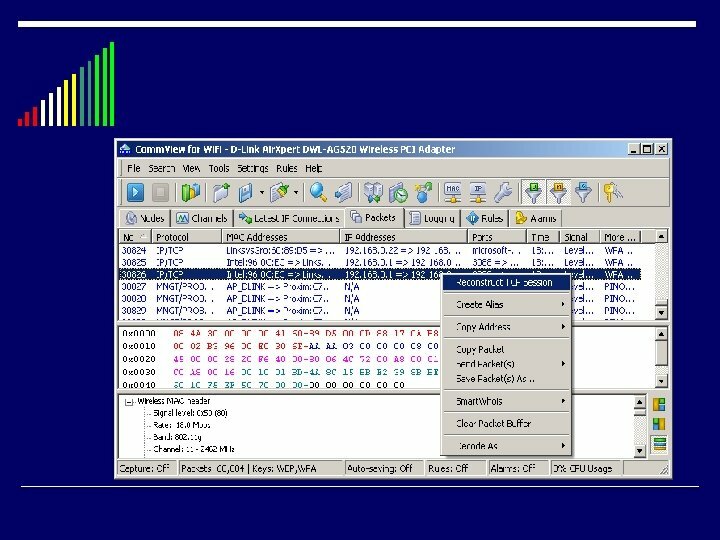 In the Network Connections window, right-click Wireless Network Connection, and then click Properties. 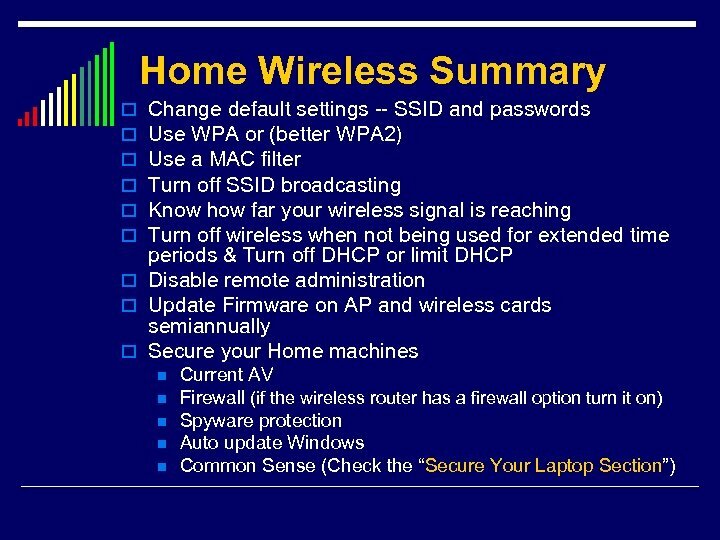 In the Wireless Network Connection Properties dialog box, on the Wireless Networks tab, make sure that the Use Windows to configure my wireless network settings check box is selected. 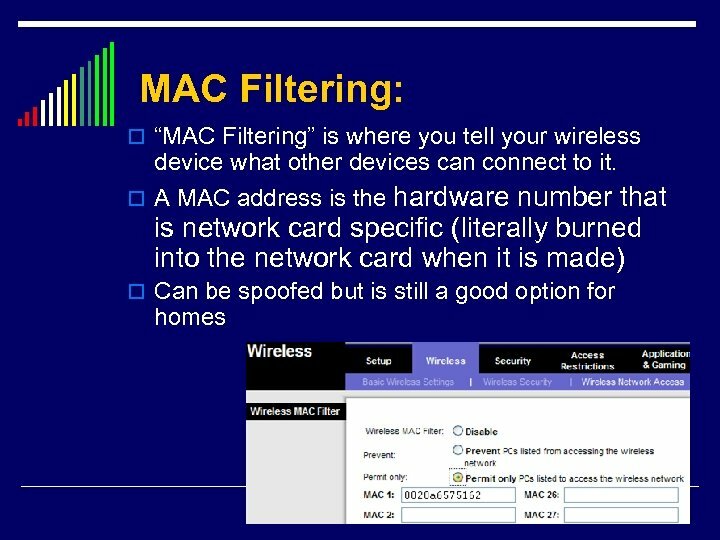 Under Preferred networks, make sure that the name of the network that you want to connect to is highlighted, and then click Advanced. 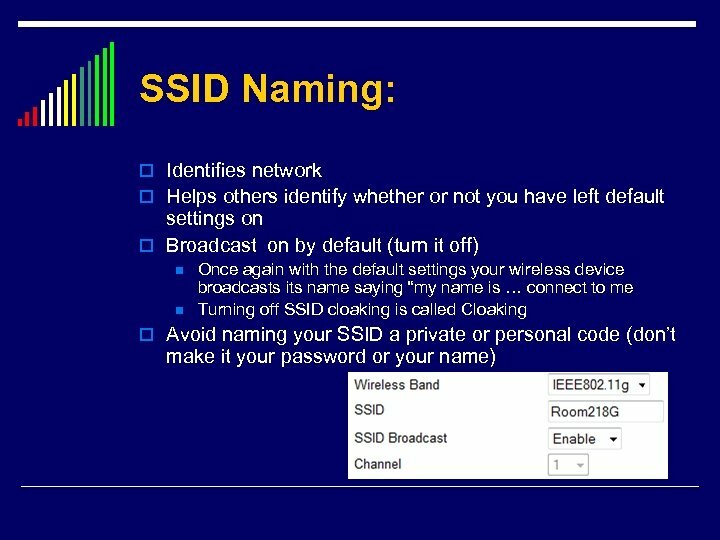 In the Advanced dialog box, click Access point (infrastructure) network only, and then click Close. Click OK.
VPN Solutions o Anchor. 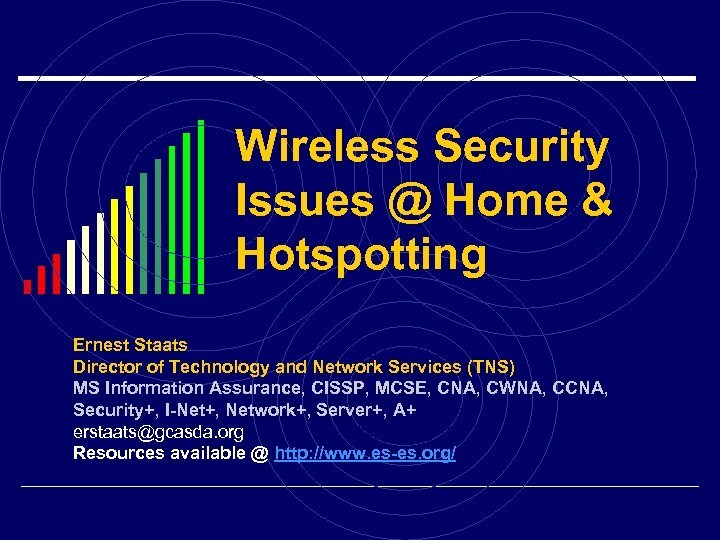 Free's Hotspot Shield, a new free software download. 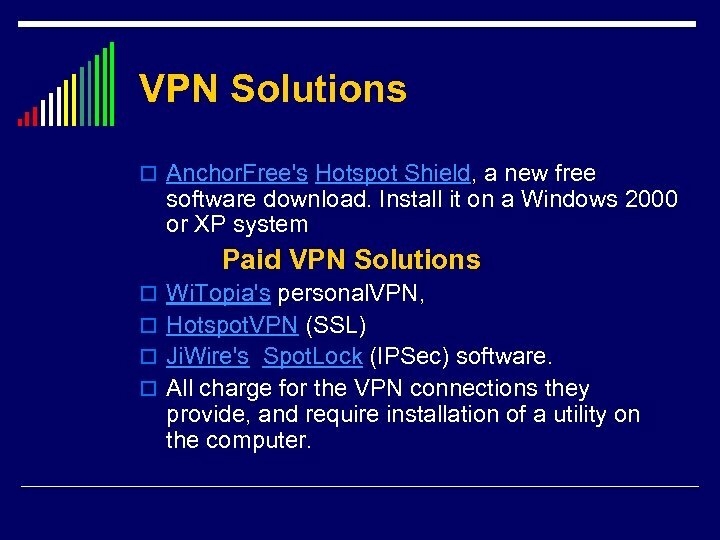 Install it on a Windows 2000 or XP system Paid VPN Solutions o Wi. Topia's personal. VPN, o Hotspot. 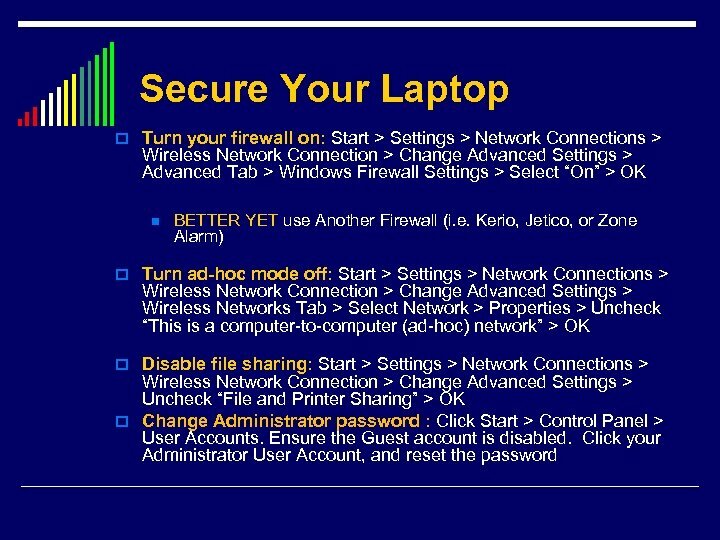 VPN (SSL) o Ji. Wire's Spot. 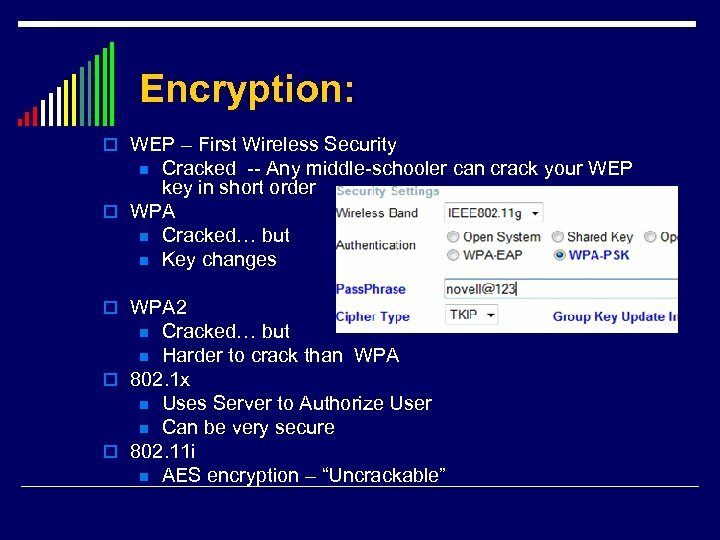 Lock (IPSec) software. 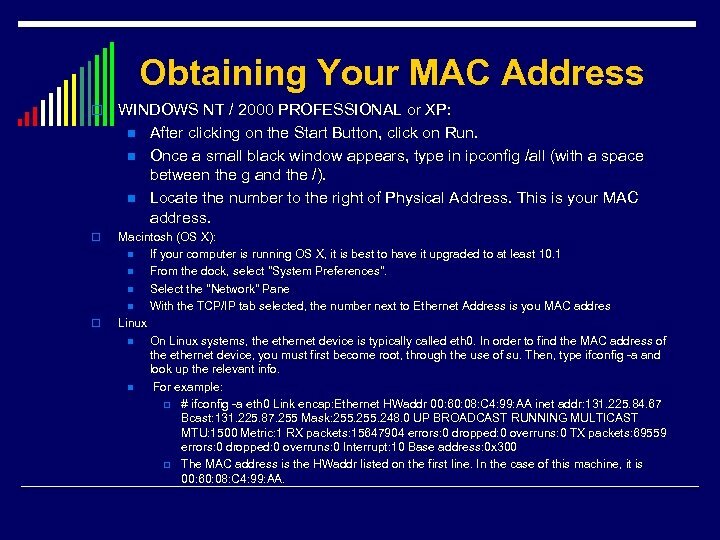 o All charge for the VPN connections they provide, and require installation of a utility on the computer. 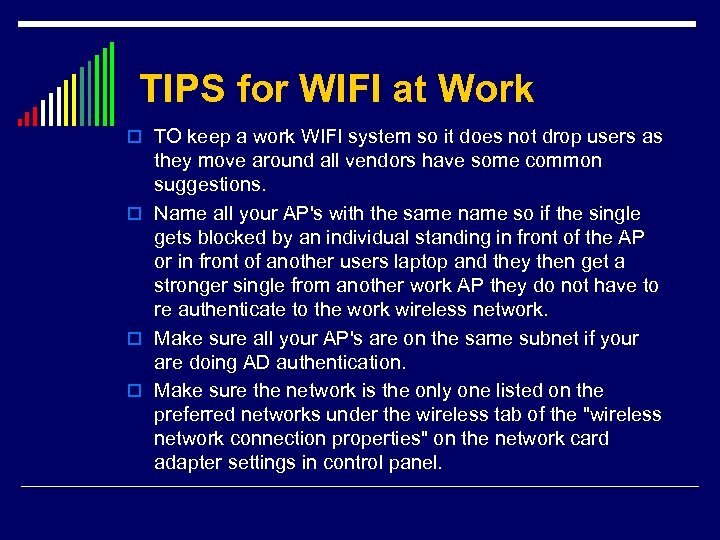 TIPS for WIFI at Work o TO keep a work WIFI system so it does not drop users as they move around all vendors have some common suggestions. 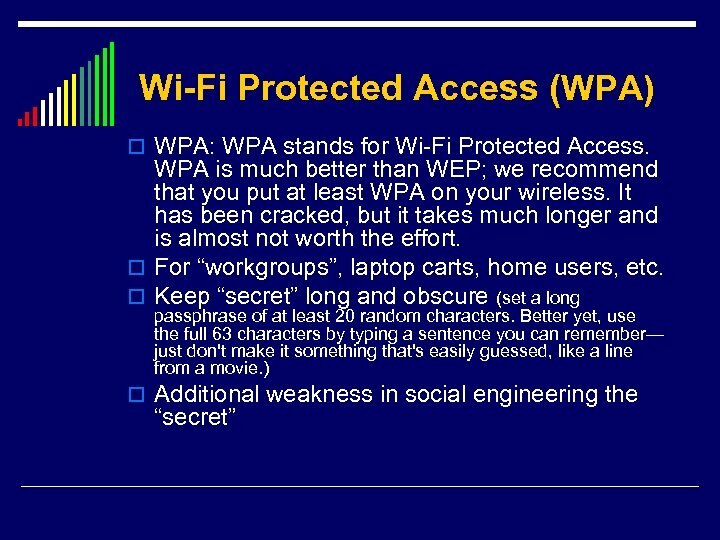 o Name all your AP's with the same name so if the single gets blocked by an individual standing in front of the AP or in front of another users laptop and they then get a stronger single from another work AP they do not have to re authenticate to the work wireless network. 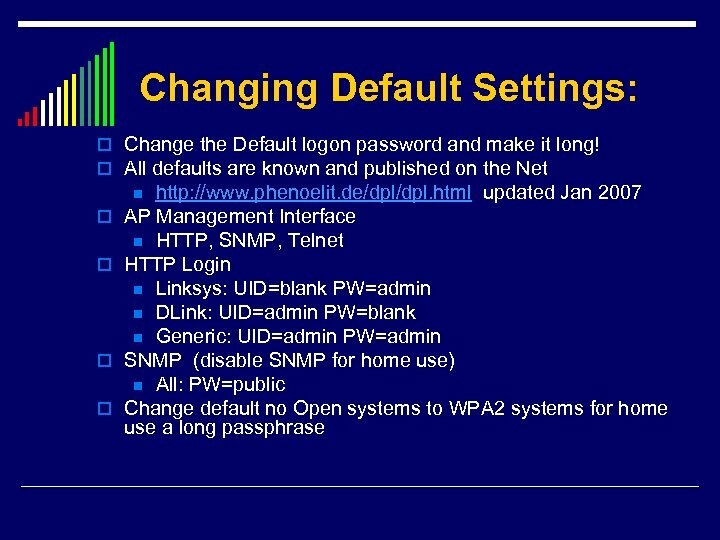 o Make sure all your AP's are on the same subnet if your are doing AD authentication. 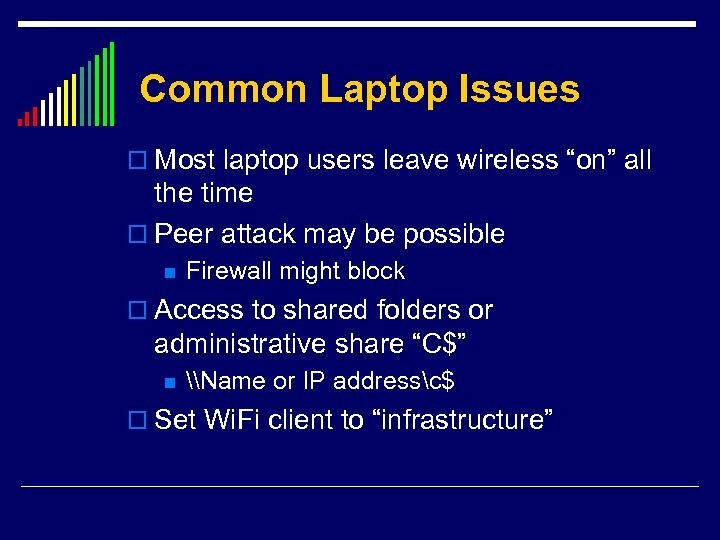 o Make sure the network is the only one listed on the preferred networks under the wireless tab of the "wireless network connection properties" on the network card adapter settings in control panel. 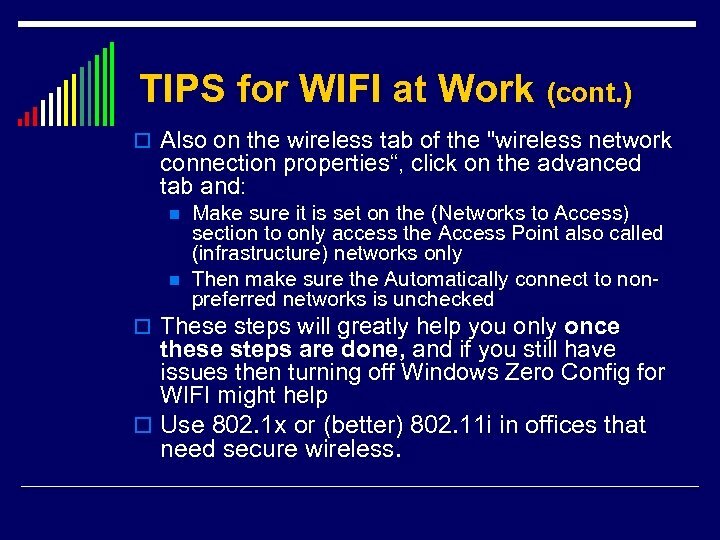 TIPS for WIFI at Work (cont. ) 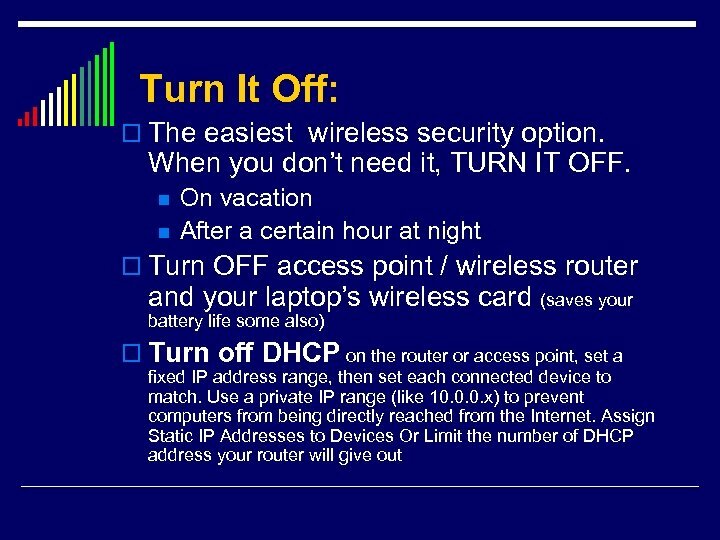 o Also on the wireless tab of the "wireless network connection properties“, click on the advanced tab and: n n Make sure it is set on the (Networks to Access) section to only access the Access Point also called (infrastructure) networks only Then make sure the Automatically connect to nonpreferred networks is unchecked o These steps will greatly help you only once these steps are done, and if you still have issues then turning off Windows Zero Config for WIFI might help o Use 802. 1 x or (better) 802. 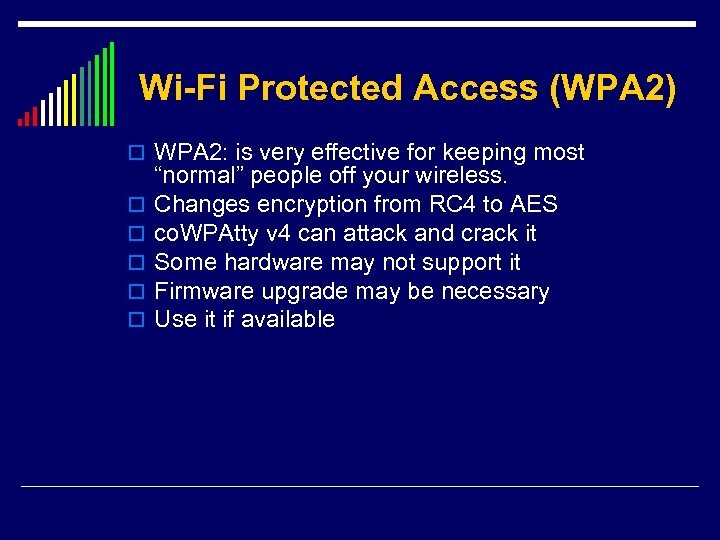 11 i in offices that need secure wireless. SECURITY Where from does the term security come?